Crescent Spire does not stand out as an obvious Spire due to its broad flat topped summit when viewed from Applebee Camp site. 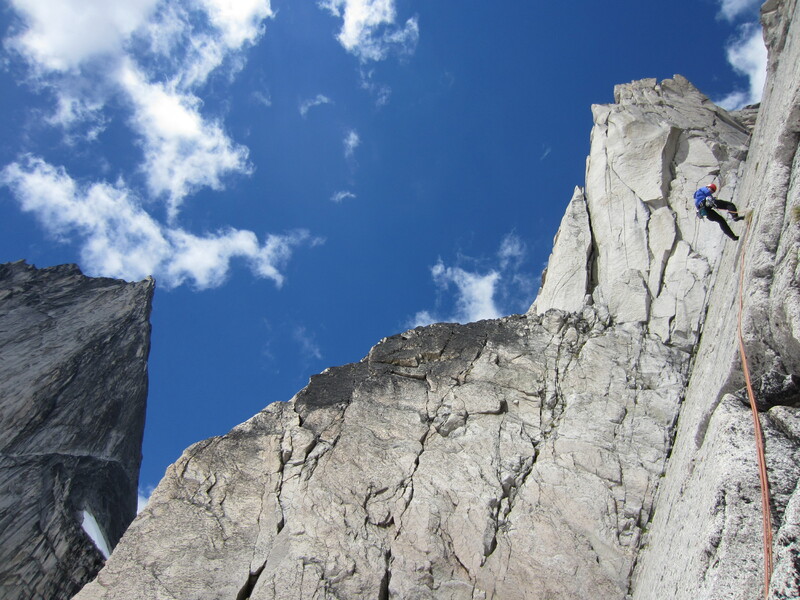 It`s main feature is the East Face which is more like a multi pitch crag with steep and high quality 5.9 and 5.10 crack climbing. During warm weather this place is a sun trap and can almost be too hot! 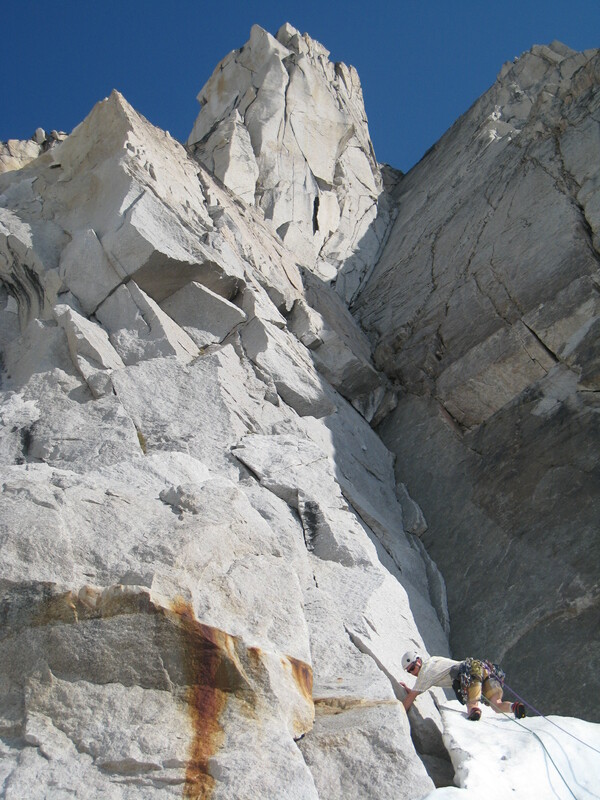 The face is rappelled and many anchors are bolted. Crescent Spire also makes for a great scramble via its NE Ridge (3rd class) in bad weather or for those just looking for easier summits close to the Kain Hut. This is normally also combined with the narrow N Ridge (Low 5th, mostly 4th) of Crescent Tower making for a double summit day! As mountaineering objectives, expect 8-10 hours for both summits return trip from the Kain Hut at a casual pace. 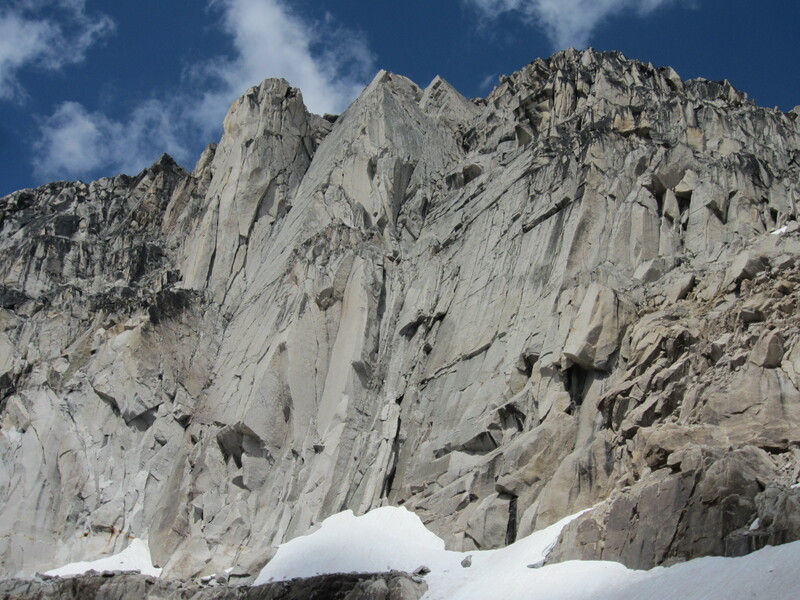 McTech Arete: 5.10b, 6 pitches. Put on your crack gloves and prepare for battle. This is true jamming at its finest on impeccable fine white granite and a perfect place to hone your crack skills. The crux comes on the second pitch with an arching finger crack flake and perfect crisp little edges for the feet. Expect 8 hours return trip from the Kain Hut. Not to be missed. Paddle Flake makes for a good alternative if there is traffic on McTech Arete. Shorts on with Jonny Simms on route to Paddle Flake in 2008.